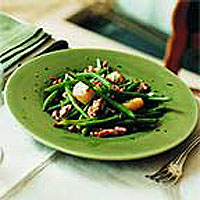 Tender, sweet scallops and crisp bacon turn green beans into a chic little starter. I use smaller 'queenies' (scallops without coral), an affordable treat from the Fish Service Counter. You could use strips of smoked salmon or cooked tiger prawns in place of scallops and bacon. Add the beans to a large pan of boiling, salted water and cook for 5-7 minutes, until just tender. Drain thoroughly in a colander and allow to cool slightly. Meanwhile, place a non-stick frying pan over a moderate heat, add the walnuts or pecans and stir for 2 minutes, or until browned. Remove from the heat. Tip the cooked beans into a bowl, add the toasted nuts, 1 tbsp of the sunflower oil and ¾ tbsp of the walnut oil and toss gently to mix. Set aside until ready to serve. Return the frying pan to the heat, add the lardons and cook for 3-4 minutes until crisp and golden, stirring occasionally. Drain the cooked lardons on a plate lined with a double layer of kitchen paper. In a large frying pan, heat the remaining sunflower oil and gently fry the scallops for 2 minutes, then carefully turn them over and fry for a further 1-2 minutes, or until just cooked. Remove from the heat. Add the lardons, the remaining walnut oil and the vinegar to the beans. Toss gently, taste, add the Tabasco sauce and adjust the seasoning. Arrange on 6 starter plates, topping each portion with 3 scallops. Serve garnished with a few snipped chives. This recipe can be prepared up to the end of step 3 several hours in advance. Cover with clingfilm and chill until ready to finish. Ready-made short cut Waitrose Smoked Salmon Parcels, from the deli chiller cabinet, served with a mixture of Waitrose Marinated Sundried Tomatoes and halved fresh baby plum or cherry tomatoes. Garnish with a few chives.